You'll not only save money but you'll save time with these packages. You won't have to worry about missing sponsorship deadlines and finding lost invoices. Just one payment to support JCBA the whole year!! If you are interested contact our office by email: jcbuilders@windstream.net. 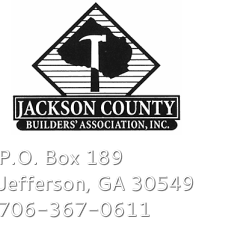 For information on sponsoring a Membership Meeting contact our office 706-367-0611 or by email: jcbuilders@windstream.net. Sponsor a Membership Meeting for $250. Get your face in front of the ones that need your service. August 14th - Sponsored Harbin Lumber Company. October 9th - Sponsored by Jackson EMC. If you are interested in sponsoring a membership meeting for 2019 please contact the office 706-367-0611 or email: jcbuilders@windstream.net. The presentation has to be educational for CE credits. January 7 - Officers & Board of Directors Meeting, 11:30 a.m., Beef O'Brady's. February 4 - Officers & Board of Directors Meeting, 11:30 a.m., Beef O'Brady's. February 13 - General Membership Meeting, 12:00 (noon), Location: Jackson EMC Auditorium, Jefferson, GA. Admission $5. Sponsored by: North Ga Brick. Speaker: Lauren Goodwin, NAHB Field Representative. This qualities for 1 hour CE for Builders! February 26-27 - HBAG Legislative Rally & Winter Board Meeting. Go to hbag.org to register. March 4 - Officers & Board of Directors Meeting, 11:30 a.m., Beef O'Brady's. April 1 - Officers & Board of Directors Meeting, 11:30 a.m., Beef O'Bray's. May 1 - Spring Golf Tournament, Double Oaks Golf Course, Commerce, GA. Information to follow. May 6-7 - HBAG Spring Meeting, Columbus, Ga, Marriott. Go to HBAG.org for more information. May 13 - Officers & Board of Directors Meeting, 11:30 a.m., Beef O'Brady's. June 3 - Officers & Board of Directors Meeting, 11:30 a.m., Beef O'Brady's. June 12 - General Membership Meeting, 12:00 (noon), Location: Jackson EMC Auditorium, Jefferson, Ga. Admission $5. Sponsored by Georgia Power Company. Speaker & Topic: TBD. No meeting or events in July. August 5 - Officers & Board of Directors Meeting, 11:30 a.m., Beef O'Brady's. ﻿September 9 - Officers & Board of Directors Meeting, 11:30 a.m., Beef O'Brady's. ﻿September TBD - Fall Clay Shoot, Valley View Clay, Danielsville, GA. Click here for more information! September 23-24 - HBAG Fall Meeting - Hilton Head Island, S.C.
October 7 - Officers & Board of Directors Meeting, 11:30 a.m., Beef O'Brady's. November 4 - Officers & Board of Directors Meeting, 11:30 a.m., Beef O'Brady's. December 2 - Officers & Board of Directors Meeting, 11:30 a.m., Beef O'Brady's. Admission to Membership Meetings $5. From I-85 North, exit at exit 137. Turn right (east) (From I-85 South turn left) on Highway 129 and go 4.8 miles to the traffic light at the intersection of Highway 129 and Highway 11 N (business). Turn left on Highway 11 N (business). Go about 2 miles and go straight through the square in town (Hwy 11 turns into Highway 15 N at the main red light in town.) Stay on Highway 15 N (alternate) for 1 mile take the split to Hwy 82 toward Maysville go approximately 3 miles and turn right onto County Farm Road and the Fire Training Center is located at 64 Fowler Drive on the right. From I-85 North, exit at exit 137. Turn right (east) (From I-85 South turn left) on Highway 129 and go 4.8 miles to the traffic light at the intersection of Highway 129 and Highway 11 N (business). Turn left on Highway 11 N (business). Go about 2 miles and go straight through the square in town (Hwy 11 turns into Highway 15 N at the main red light in town.) Stay on Highway 15 N (alternate) for 1 mile toward Commerce. Jackson EMC is located at 850 Commerce Road on the right. From I-85 take exit 137 (Hwy 129)Gainesville/Jefferson, turn south on Hwy 129 toward Jefferson approximately 5 miles. Stay on Damon Gause by-pass. Travel to the first traffic light turn and turn left on to Winder Highway (Ga-11). Go about 2 miles and through 2 traffic lights. Turn left onto Storey Street at Wachovia Bank. The civic center is on the right. 65 Kissam Street. I-85 to exit 137 (Hwy 129) Gainesville/Jefferson, turn south on Hwy 129 toward Jefferson approximately 4.5 miles. Stay on Damon Gause by-pass. Turn left on Old Swimming Pool Road at First Georgia Bank. Go to 4-way stop, turn left on Longview Drive. The club house is on your left. 302 Longview Drive. From Athens: Take US 441 N. approximately 25 minutes, where you will come to a red-light for Hwy 98. Turn right onto Hwy 98, and Double Oaks will be 1.5 miles on your right. From Atlanta: Take I-85 North to exit 149. (This is the Commerce exit at the outlet malls.) Turn right off the exit onto 441 South toward Athens. You will go south for about 5 miles, where you will come to the red-light for Hwy 98. Turn left onto 98 and Double Oaks will be 1.5 miles on your right.